The production of anything associated with Cervantes’ classic tale “Don Quixote” is traditionally difficult at best. So perhaps Terry Gilliam, brilliant yet manic filmmaker was tempting fate when he vowed to try his own at Quixote. No stranger to cinematic disaster after the plagued and basically failed production of The Adventures of Baron Munchausen, Gilliam embarked on his dreamlike Quixote quest with the Baron’s failure planted firmly before him as a warning. In the end, even that was not enough. His film, The Man Who Killed Don Quixote crashed and burned in the midst of filming, stranding investors and depriving the world of yet another Terry G masterpiece. Fortunately for us, someone caught it all on tape. 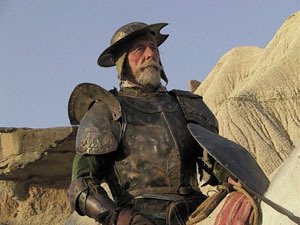 What was to have been a DVD “making of” featurette became Lost in La Mancha: A funny, factual, and heartbreaking chronicling of what happens when man and God work in harmony to doom a film in mid-birth. 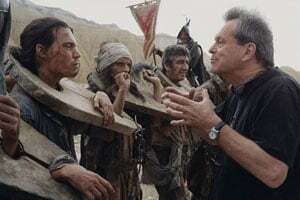 From pre-production to the birth pains of filming, Lost in La Mancha follows Gilliam, his crew, and his cast in a tragedy of bad luck and poor planning that utterly dooms what could have been a truly magnificent film. 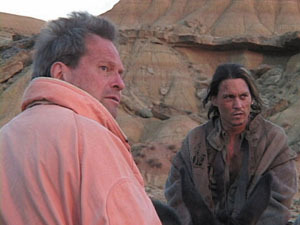 Gilliam’s take on the Quixote legend found a modern day man (Johnny Depp) traveling through time to fall at the feet of Quixote (Jean Rochefort), who naturally mistakes him for his faithful Sancho. Depp like everyone knows the film is doomed. Flood and sickness, army jets and just bad planning make it plain. But Depp puts on a brave smile and plugs on, even in the face of what looks like total failure. The few glimpses we get of his performance are saddening, not because they lack, but because they’ll never make it into any film. 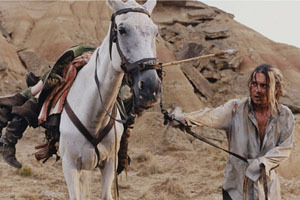 The eventual killer is the illness of Jean Rochefort, cast to play Don Quixote and cutting a startlingly accurate figure atop his tired old nag of a mount Rosamonte. Rochefort, a true professional struggles to stay on his horse even through great pain. 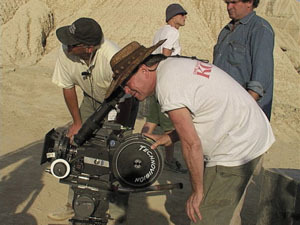 Gilliam struggles to keep shooting through hail and rain and failure. Struggle and fight only to be brought to a screeching halt by the perilous forces of reality. It all happens so fast, that Lost in La Mancha, despite 96 minutes of run time seems to end far to quickly. Understandably, there is only so much to show, but I couldn’t help wishing that this particular documentary had found just a little bit more. Still, this is a truly moving and insightful journey. A documentary that lets you connect with the people inside it as well as what it is they are trying to do. Usually we only see the successes, take a moment to see what happens when great directors fail.